INTERFERin™ | Tamar Laboratory Supplies LTD.
INTERFERin™ is a new generation of siRNA transfection reagent which provides more than 90% silencing efficiency at 1nM siRNA in a wide variety of cells. For adherent cell lines or primary cells, 1 nanomolar or less siRNA concentration are sufficient to obtain more than 90 % gene silencing for a variety of genes. 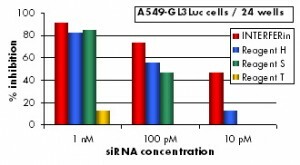 For difficult-to-transfect suspension cell lines, 80% silencing can still be reached by INTERFERin™ using 5 nM siRNA concentration.1 ml of INTERFERin™ is sufficient to perform 500-1000 transfections in 24-well plates.